Lt. Gov. 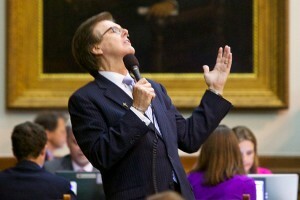 Dan Patrick, R-Texas. Lt. Gov. Dan Patrick on Tuesday announced he is asking Attorney General Ken Paxton to weigh in with an official opinion on whether the Fort Worth ISD’s policy on protections for transgender students is legal under Texas law. My fellow former radio talk show host acknowledged that he is “not a lawyer,” so he’s asking an indicted lawyer’s office whether Superintendent Kent Scribner has violated the Texas Education Code with a restroom policy to accommodate transgender students. The Texas Senate’s presiding officer accused the school district of holding “sham hearings” on the policy – a statement loaded with irony given the way the Senate, under Patrick’s leadership, has become a no man’s land for stakeholders on a variety of issues. Ask law enforcement how they were treated by the Senate on open carry legislation and immigration enforcement policy. Ask local governments how their input is being received during a traveling roadshow on property taxes. What is this toilet tantrum about? That’s easy. Patrick, in an address to the Texas Institute for Education Reform, said school superintendents are not God – which was quite a revelation – and school boards should not be a rubber stamp for social engineering. No child should be trapped in a failing school, Patrick said, going on to praise Texas Public Policy Foundation founder and board member Jim Leininger’s support of private school scholarships in San Antonio. Patrick has said the state should forego millions in federal dollars for free and reduced-priced meals for poor students if the Obama Administration sticks to its guns on its guidance on nondiscrimination. Today, Patrick repeated that and added that he is sending a letter to all Texas superintendents advising them to ignore the administration’s guidance. Obama is putting resources for public education at risk, Patrick argued. Since Patrick wants “school choice” legislation on the Senate’s front burner again in 2017, he is just as willing to put public education resources at risk. It’s just that it would be done in a way that would allow for discrimination against the children of parents who will still not be able to get their kid into a better school, whether that student is transgender or not. Copyright May 31, 2016, Harvey Kronberg, www.quorumreport.com, All rights are reserved. Reprinted with permission.